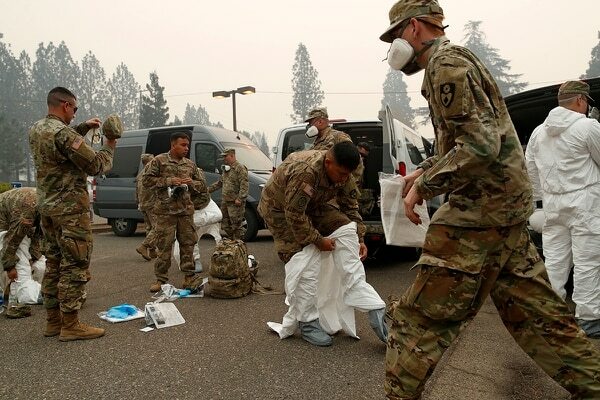 PARADISE, Calif. — With at least 130 people still missing, National Guard troops searched Wednesday through charred debris for more victims of California’s deadliest wildfire as top federal and state officials toured the ruins of a community completely destroyed by the flames. 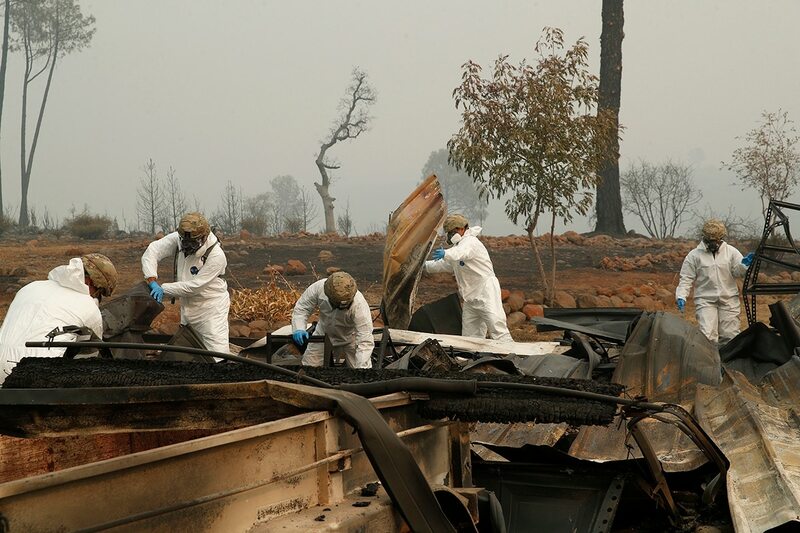 Nearly 8,800 homes were destroyed when flames hit Paradise, a former gold-mining camp popular with retirees, on Nov. 8, killing at least 56 people in California's deadliest wildfire, Sheriff Kory Honea announced Wednesday evening. There were also three fatalities from separate blazes in Southern California. Honea said the task of searching for bodies was so vast that his office brought in another 287 searchers Wednesday, including the National Guard troops, bringing the total number of searchers to 461 plus 22 cadaver dogs. He said a rapid-DNA assessment system was expected to be in place soon to speed up identifications of the dead, though officials have tentatively identified 47 of the 56. It will take years to rebuild the town of 27,000, if people decide that's what should be done, said Brock Long, administrator of the Federal Emergency Management Agency. The town in the foothills of the Sierra Nevada Mountains looks like a wasteland. "The infrastructure is basically a total rebuild at this point," Long said. "You're not going to be able to rebuild Paradise the way it was." Wildfires have been raging across the western United States this summer, and as in many natural disasters, elements of the Army and Air National Guard and Air Force Reserve have been mobilized to assist local communities. The number of missing is "fluctuating every day" as people are located or remains are found, said Steve Collins, a deputy with the Butte County Sheriff's Department. 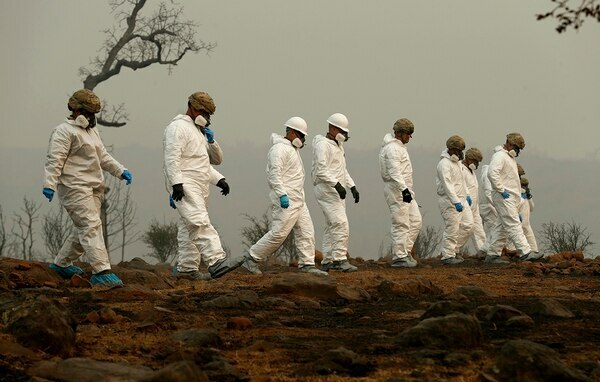 Authorities on Wednesday released the names of about 100 people who are still missing, including many in their 80s and 90s, and dozens more could still be unaccounted for. Sheriff's department spokeswoman Megan McMann said the list was incomplete because detectives were concerned they would be overwhelmed with calls from relatives if the entire list were released. "We can't release them all at once," McMann said. "So they are releasing the names in batches." Sol Bechtold's 75-year-old mother was not on the list. Her house burned down along with the rest of her neighborhood in Magalia, a community just north of Paradise. "The list they published is missing a lot of names," said Bechtold, who's still searching shelters for his mother, a widow who lived alone and did not drive. A sheriff's deputy asked Bechtold on Wednesday for information that could identify her remains, like any history of broken bones. He told the officer she had a knee replacement. Bechtold predicted that the death toll would rise sharply. "I feel horrible for the sheriff. I feel horrible for the people of Paradise and Magalia," he said. "It's just a no-win situation unless a few hundred folks just show up out of nowhere." Selsky reported from Salem, Oregon. Contributing to this report were Associated Press writers Janie Har and Olga R. Rodriguez in San Francisco.